Dr. Eric Winchester has had a passion for animals his entire life. This passion for helping animals propelled Dr. Winchester to earn a veterinary medicine degree from Auburn University in 1972. Having strong ties to the Jacksonville community where they were born and raised, Dr. Winchester and his wife Janis moved back to the area after college. 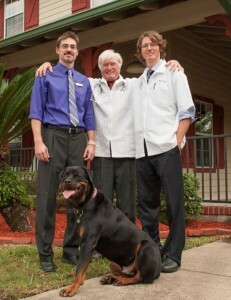 Dr. Winchester began practicing in the Murray Hill area of the city before opening Julington Creek Animal Hospital in 1975. Dr. Winchester focused not only on small animals, but horses as well, the first to do so in the Jacksonville community. When the horse population moved further south, Dr. Winchester began treating small animals exclusively. The Winchester’s first son, Rod, was born in 1972 and he found himself working at the animal hospital as a small child. Both Rod and younger brother Jason attended Bolles High School and both graduated from Mississippi State University. Rod followed in his father’s footsteps, earning his degree in veterinary medicine and then joining his father’s practice in 1998. It was at this juncture that the idea of Julington Creek Animal Walk began to take place. With a goal of creating the highest quality care facility of its kind in the United States, Dr. Winchester, along with Janis and Rod, traveled the country researching pet boarding and resort facilities. After looking at countless projects, they pulled best ideas for design and installed best practices for operations to create Julington Creek Animal Walk, a nine-acre pet resort featuring an off-leash dog park, boarding, daycare, grooming, and training. In 2010, the Winchester’s second son, Jason, joined the growing practice. Jason worked for eleven years as an IT consultant for Accenture, having designed and implemented HR, AP, AR, and GL solutions for fortune 500 companies such as Marriott International, Toys “R” Us, and Laboratory Corporation of America among others. These experiences helped Jason transition into a managerial and strategic role at Julington Creek. Today, Julington Creek Animal Walk is a facility that caters to every need for our guests. Our goal is to provide a comfortable and safe environment for all guests in our care while offering an array of activities to keep your pet engaged. We treat your pet as our own.